My own copy of this pressing sounds very good indeed. Wonderful album. The perfect CD to listen in the morning (except for "I See You Baby",maybe), or during the evening. Some house tracks here ("If Everybody Looked The Same") but a nice downtempo journey overall. The last song "Inside My Mind" is a chill-out anthem, in a manner of speaking. The sound of this release is very good and the "carbon neutral" package is very well intentioned. It's not too late ! Listen and relax. I'm coming across a bit of skipping on Side C. Is anyone else having the same issue? Amazing pressing, no background noise, no clicks or pops. Sonics are very nice, well done reissue! Any idea who did the scratching on 'Private Interlude'? Looking back on this album, Groove Armada had kind of an unlikely existence with bacnds like Moby and Crystal Method at their doorstep waiting to feed them ideas. But they strived and came up with their own unique, chill version of electronica at the time (which this album features a cheap hit, "I See You Baby"). One of the first techno releases that I got into that featured horns and down singers, this was a great way to wake up in a morning in the late-90's or so. If you like chill morning music, I'd pick this up. 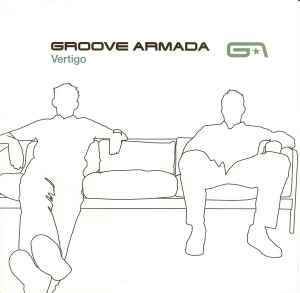 <I>Vertigo</I> is the album that brought Groove Armada into the big time, with good reason too. While it keeps most of the soul and groove of <I>Northern Star</I>, it also boasts better production values and some club-ready hits, like “I See You Baby” and “If Everybody Looked the Same.” But it also has the gorgeous downtempo tracks “Dusk You & Me,” “Serve Chilled,” and “Inside My Mind (Blue Skies)” and the slow jam “Pre 63.” And, of course, “At the River” is so good that it had to make a repeat appearance here. There’s a romantic quality to the vocals of “Your Song,” which is put in counterpoint to the phat beats. You can hear their sound developing -- another strong entry in the Groove Armada legacy.